This week we have a look at the latest order for Holland America Line’s first “Pinnacle” class vessel in comparison to other ships, particularly the line’s own “Signature” class ships Eurodam and Nieuw Amsterdam, their competitor’s “Celebrity Equinox” class, and the “Costa Luminosa” class, the basic platform of which will apparently be used in the new design. Elsewhere, we have a look at an impending change of marketing policy at Hapag-Lloyd Cruises and the takeover of Germany’s TransOcean Cruises by UK-based Cruise & Maritime Voyages. Beyond the names of the interior designers, no new information has yet been released on the first of Holland America Line’s new “Pinnacle” class ships, although images have been floating around the Internet for some months now. Originally ordered from Fincantieri in October 2012, along with a 4,000-passenger vessel for sister brand Carnival Cruise Lines, for delivery in 2015, the Holland America ship has now been delayed until mid-February 2016. The new “Pinnacle” class ship (whose name will end in “dam”) will be the first new Holland America ship in more than five years and the largest ship yet built for the line. With a beam of 115 feet, she would not be able to transit the present Panama Canal locks but she will be able to transit the new wider locks that are now under construction. This new class of ship will measure 99,700 tons and have 2,660 berths, within striking range of arch-competitor Celebrity Cruises’ 2,850-berth “Equinox” class. 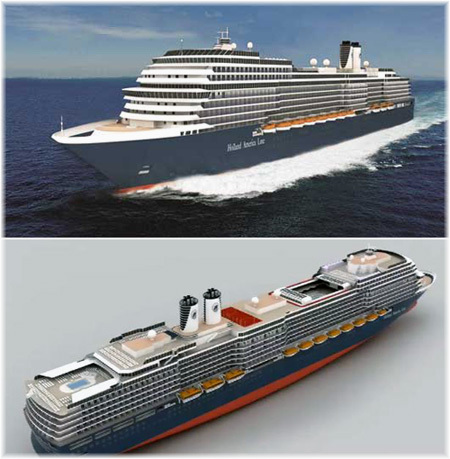 According to sources, while being larger versions of the “Signature” class vessels Eurodam and Nieuw Amsterdam, the new Holland America design is actually based on the platform of the 92,720-ton “Costa Luminosa” class, although with a lower passenger space ratio (the measure of gross tons volume per passenger). The hull has been lengthened and widened, two more decks added forward and certain other changes made, including lowering the lifeboats, the elimination of the atrium in the Costa design and the relocation of the Tamarind Restaurant from a forward position on the “Signature” class to one aft on the new “Pinnacle” ship. Compared to the “Signature” class (which can transit the present Panama locks), the new class will be 15% larger in volume but carry 25% more passengers. This will mean they will have a passenger space ratio of only 37.5 tons per passenger compared to 41.6 for the existing “Signature” class. 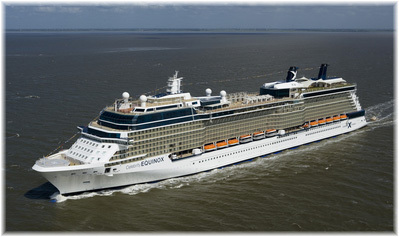 While the lower PSR follows recent industry-wide trends for mainline ships to dip below 40, this ratio does not compare well with her predecessors (it is a reduction of almost 13% on the “Signature” class), nor with the “Celebrity Equinox” class (12% less space per guest on HAL) nor even the “Costa Luminosa” class (8.5% less). While some might question the use of a Costa platform for a Holland America Line ship this has actually been done before. In the 1990s, Fincantieri built two classes of ship, the two 1,288-berth “Costa Classica” sisters for Costa Cruises (1992/93) and four 1,260-berth “Statendam” class ships for Holland America (1993/96), using the same basic hull design. These ships have been so successful that all six are still in service with their original owners two decades later. Meanwhile, a new interior designer for Holland America, Adam Tihany, has joined Bjorn Storbraaten, who designed the public rooms for Holland America Line’s “Signature” class, to ensure that the new “Pinnacle” class will meet the expectations of previous Holland America Line clients, some of whom are questioning whether the new ship, with 25% more berths, will be one step too far in terms of size for Holland America. 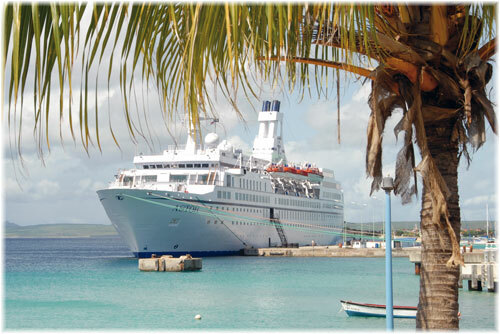 As Celebrity has proven with its “Celebrity Equinox” class, this number of passengers need not be a drawback, although the Celebrity ships have a higher tonnage. As it happens, the “Pinnacle” class capacity is also within 40 berths of that most famous of existing ships, the 2,620-berth Queen Mary 2, although with a tonnage of 148.528, the Queen Mary 2 offers a very generous 56.7 tons per passenger, more than half as much again as the new “Pinnacle” class. The new dimensions would even allow passage of ships such as the Oasis of the Seas and the Queen Mary 2, were it not for the fact that the existing bridge at Panama City does not have enough height to allow them to pass underneath. The maximum air draft (height from waterline to topmost part of the ship) for the Panama Canal is limited to less than 190 feet. While Oasis of the Seas and Queen Mary 2 both need well over 200 feet. With the introduction last year of the new internationally-marketed 516-passenger Europa 2 and the redelivery this year of the German-market 684-passenger Columbus 2 to Oceania Cruises, where she will resume service as Insignia, Hapag-Lloyd Cruises is about to change the way it markets its fleet from next year. Starting with the new 2015 brochures as they are released, the ultra-luxury cruise ship Europa 2 and 184-passenger expedition ship Hanseatic will be marketed internationally, while the 408-passenger ultra-luxury cruise ship Europa and 164-passenger expedition ship Bremen will be reserved for the German market, reverting to using German only on board. From its inception, the Europa 2 has been conceived as an international ship, to be marketed with menus, daily programs and announcements (thankfully, very few) being made in both English and German. Likewise, the Hanseatic has a long history of participation in the English-language market, dating back to the time when Radisson Seven Seas Cruises included this ship in its own portfolio. On the other hand, the Europa and Bremen have always been sold primarily in the German-speaking market, with a limited number of cruises set aside for each ship each year that would be operated in both German and English. These “international cruises” will be dropped. All in all, the English-language market still gains, however, as the two ships dedicated to the international market are the top-rated cruise ships in the world. 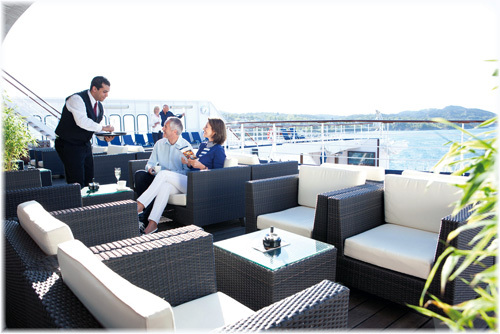 The five-star-plus Europa 2 has scored the highest ranking for any ship in the Berlitz Complete Guide to Cruising & Cruise Ships, while the five-star Hanseatic is the highest-rated expedition ship in the world. The market was taken by surprise last week by the announcement that UK-based Cruise & Maritime Voyages would take over the tour operations of TransOcean Cruises and enter the German market. Cruise & Maritime first opened a Munich-based ship management office in early 2013 to look after the logistics for its river ship, the 160-berth Vienna I, under the Signature River Cruise brand. Under the agreement with Munich-based Premicon AG, Cruise & Maritime assumes immediate responsibility for the charter, operation and marketing of the 600-passenger cruise ship Astor, including her 7,000-passenger summer 2014 program from Kiel, Bremerhaven & Hamburg. The agreement also includes the charter of four European river cruise ships: the 176-berth Belvedere, 150-berth Bellefleur, 180-berth Bellejour and the 80-berth Sans Souci, operating on the major rivers of Europe. The vessels will continue to be marketed as a German-speaking product under the TransOcean brand with distribution channels unchanged, although selected future sailings will now be designated as international. This news follows the announcement early in 2013 that Cruise & Maritime was opening an office in Sydney to support the charter and operation of the Astor for three winter seasons (November though May) commencing this winter with Australian program based on Fremantle. 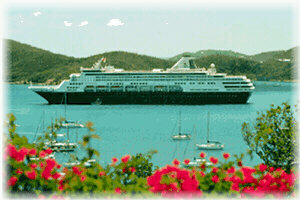 The Astor has replaced the program that was once operated by the now-defunct Classic International Cruises. Cruise & Maritime is part of the Greek-based Global Maritime Group and operates two ocean vessels of its own, the 800-berth Marco Polo and the 700-berth Discovery. Combined Cruise & Maritime ocean fleet passenger carryings are projected to exceed 70,000 passengers in 2014 representing a growth of almost 100% since 2010.